SGX Day Traders: 2014 Jun 24-- #sgxdaytraders Spotted Frasers Cpt a potential Bullish reversal Setup follow up post. 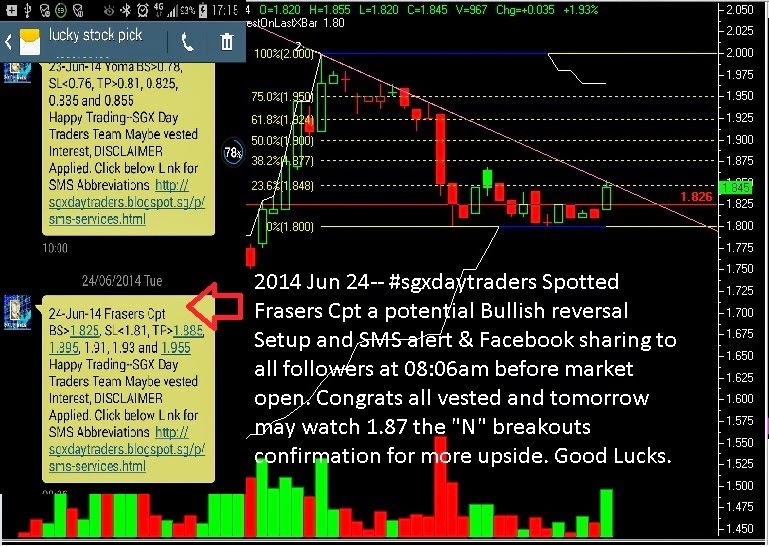 2014 Jun 24-- #sgxdaytraders Spotted Frasers Cpt a potential Bullish reversal Setup follow up post. 2014 Jun 24-- #sgxdaytraders Spotted Frasers Cpt a potential Bullish reversal Setup and SMS alert & Facebook sharing to all followers at 08:06am before market open. Congrats all vested and tomorrow may watch 1.87 the "N" breakouts confirmation for more upside. Good Lucks.